You may have heard, during the World Cup, of a German octopus named Paul who was able to accurately predict the winner of all the soccer matches. People would put the flags of various nations into his tank, and he would swim over to the flag of the nation that would win the match and try to eat it. Apparently he was right 100% of the time, which is better than most of the soccer experts on TV. Wikipedia says the odds of this happening by chance are about 255 to 1. What is that calamari doing on a Spanish flag? Anyway, Paul the Octopus somehow established an international following of believers. Believers. And if you can get millions of people around the world to believe in the prognostications of an internationally acclaimed cephalopod, then you can pretty much get anything you want. 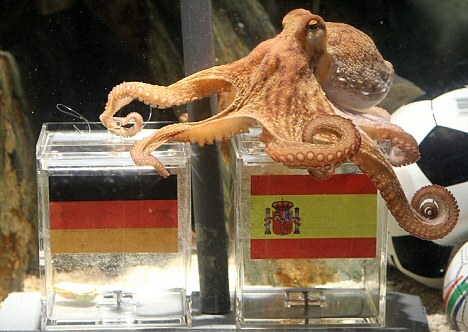 This is how Paul the Octopus's owners plan to make their millions. Several marketing consultants have suggested that Paul could be worth about $4.5 million as a product "spokesman," and could also charge significant fees for public appearances. Even if he loses his abilities, I'm sure you could turn him into calamari and sell him to a good restaurant for about $40 per pound. *Actually, I'm going to take that back. An octopus that could definitively tell me how long it will take to get my stairwell painted would be quite useful to me. There, I said it. Soccer matches are less interesting than painting a stairwell.